Fancy owning your own pub? Well, now you can as one goes under the hammer at our Kent and South East London event on Tuesday 11 December. The Telegraph pub in the pretty Kent seaside town of Deal is a real jewel for anyone looking to get behind the bar pulling pints and enjoying a laugh with the friendly locals! Located in a quiet residential area between Deal and Walmer, The Telegraph has been much loved by those in the area for many years. Deal Town Football Club’s ground can be found to the north of the pub and Deal and Bettshanger Rugby Club to the south, making the pub a popular spot on match days for either sport. Other sports venues nearby include Walmer Tennis Club with its grass courts and Tides Swimming Centre that has clay tennis courts, football pitches and a skate park beside it. 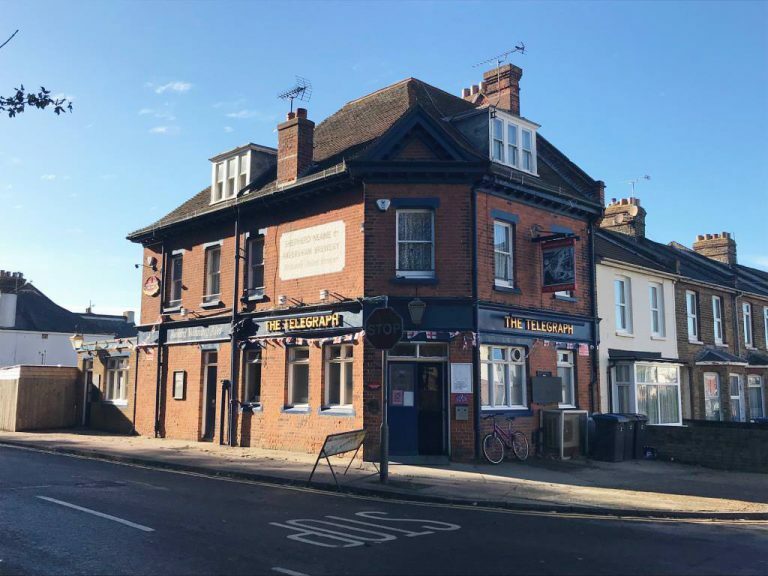 The ground floor of the property is where the pub area is located with a bar/restaurant space, U-shaped bar servery, kitchen and ladies and gents W.C.s. On the first floor is private accommodation, with three bedrooms, a living room, kitchen and bathroom. To the rear of the property, there is a large, fenced patio garden, perfect for having a drink or two in the sun. The quaint town of Deal has seen lots of exciting developments in the last decade, helped in part by the arrival of the High Speed 1 (HS1) railway line which has greatly reduced the time it takes to get to London – St. Pancras is 1 hour 20 minutes away. Many independent shops, restaurants, bars and art galleries have opened in recent years to give this former fishing, mining and garrison town a major boost. Walmer train station and Deal train station (both on the HS1 line) are roughly equidistant – about 1.5km from the pub in either direction. Deal High Street is also about 1.5km away, while the seafront at Walmer Green, with its bandstand and colourful boats moored on the beach, is about a 10-minute walk away. The freehold pub will go to auction on Tuesday 11 December at the Clive Emson Conference Centre, Kent County Showground, Detling Hill, Maidstone with a guide price of £220,000 plus fees. To book a viewing call us on 01622 608400 or alternatively let us know online when is suitable for you.